Create Account | Forgot Password? | Forgot Username? Visit Create Account. Once your account has been created, you will be able to search for courses and complete requirements to receive CE. Already have a TCEO account from the previous system? To move your account to the new system please sign in above using your existing TCEO username and password. Once signed in, follow the prompts to verify and update your account. After your account has been updated you will sign in using the email and password you provide during this update. Going forward you will use this email address and password to sign in. Follow these 9 Simple Steps to earn continuing education for the courses you have taken or conferences you have attended! Training and Continuing Education Online (TCEO) is a system that provides access to CDC educational activities for continuing education (CE). 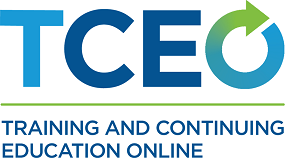 Use TCEO to search for CE opportunities, complete course evaluations and posttests, receive your CE certificates, and manage your CE transcript. Click OK to stay logged in.